Aurora Suite, an interactive strategic solution by Minacs Marketing, enables clients to manage and track their digital marketing campaigns easily online. 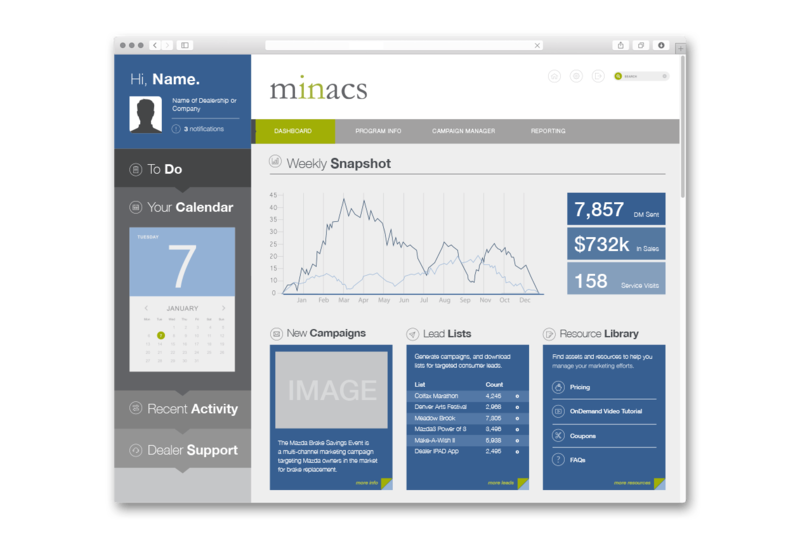 It can be customized to fit the needs of each client, offering campaign creation, analytics, monitoring of program activity and reporting. 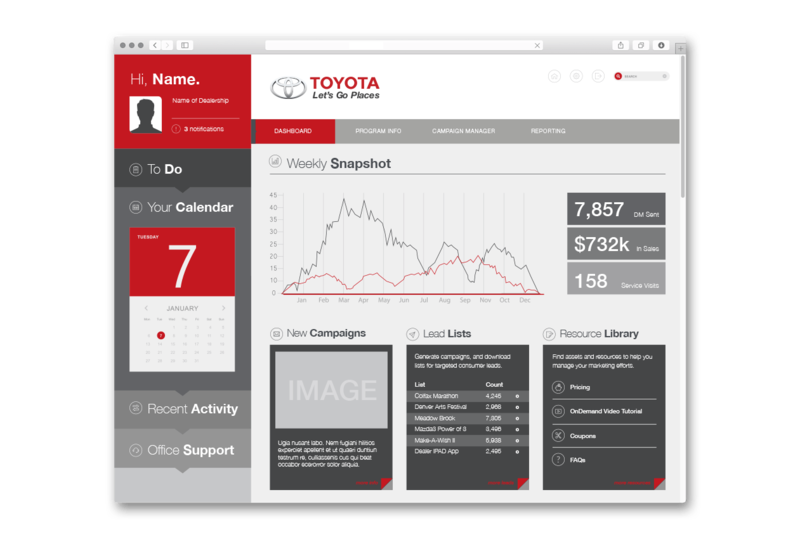 Clients also can access powerful tools to engage customers such as lead management, mobile messaging, social media management, and telematics. It is an effective web portal that gives clients everything they need to market and manage their business. 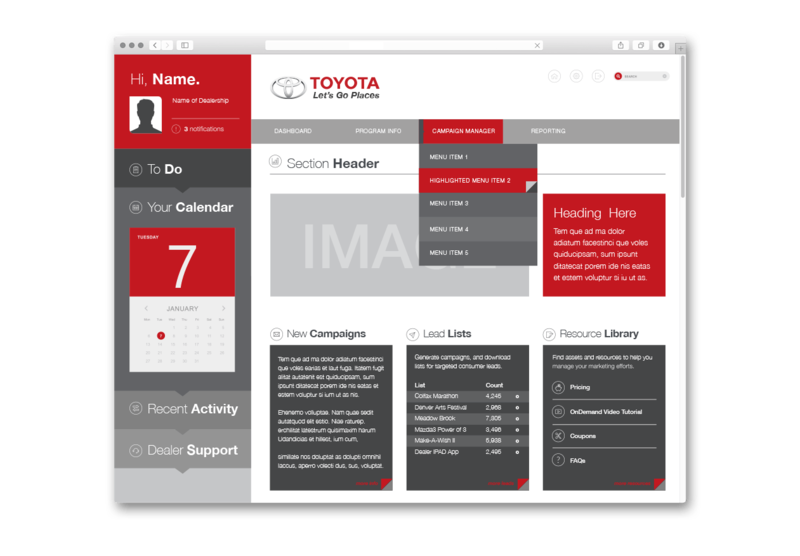 Minacs’ VP of Marketing Solutions Operations, impressed with my interactive background and my ability to successfully transform the entire creative element of the Honda Owners Lifecycle Communications program, tapped me for the Aurora Suite project. 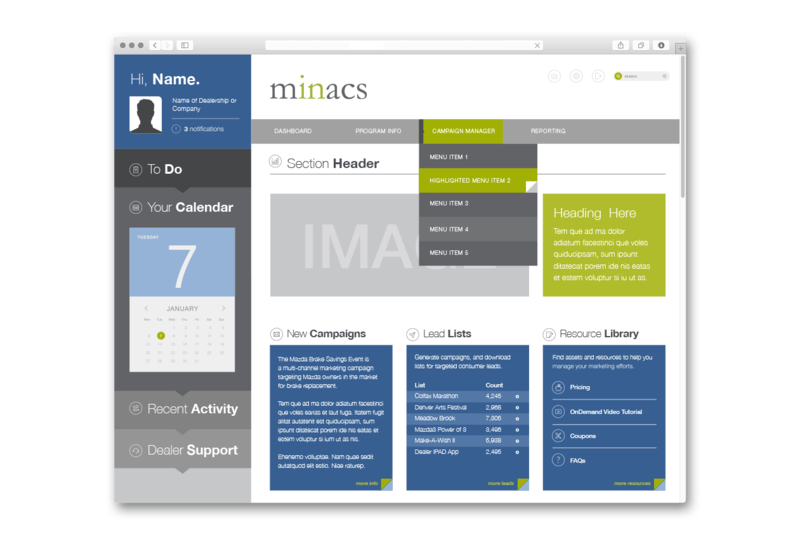 Minacs wanted me to update the entire user interface and information architecture to remain highly competitive with today’s digital standards and market demand. I worked to identify all services, customer touch points and other elements, which needed to be organized into a simplified modern user experience. I then developed several options for an updated UX structure and user interface. My solutions included a simple, minimal update to the existing design, a beautiful image-based parallax layout, and a fully customizable solution with responsive modular elements that can be configured by clients adding and removing them as needed. Given its versatility and endless configurability, we all loved the responsive modular option. From that point, I worked with my creative team to design page layouts with different configurations and skin the design with various client branding logos and colors. Every element fit into the modular user interface like a glove. After testing the user interface layouts I directed my web development team to bring the new Aurora Suite interface to life. Management was pleased with the result and thought that it was extremely versatile for any brand and configuration, while the user interface delivered a reduced learning curve as compared to the previous version. Aurora Suite clients were pleased with the updated, simplified easy-to-use interface.